Why is it important to make the correlation with the current education system and oppression? What is your role as a facilitator, social worker and educator (e.g. : in stimulating spontaneity, creativity and imagination)? How does your classroom or your learning space (from seating to colors and aesthetics) liberate the minds of the youth, so they can experiment, explore and express? What is your process of developing young leaders in your space? How does your space facilitate tangible skills and connection to the community? This workshop is for the social worker, educator, (music) teacher, music therapist who realizes that knowing about Hip Hop culture is one thing, applying Hip Hop pedagogy is another and wants to make an appropriate connection with the youth that she/he is working for and with. "Kamala’s brown skin and costume — self-fashioned from an old burkini — point to Marvel Comics’ desire to diversify its roster of superheroes (as well as writers and artists). As creator Sana Amanat explained on “Late Night With Seth Meyers” last month, representation is a powerful thing, especially in comics. It matters when readers who feel marginalized can see people like themselves performing heroic acts. 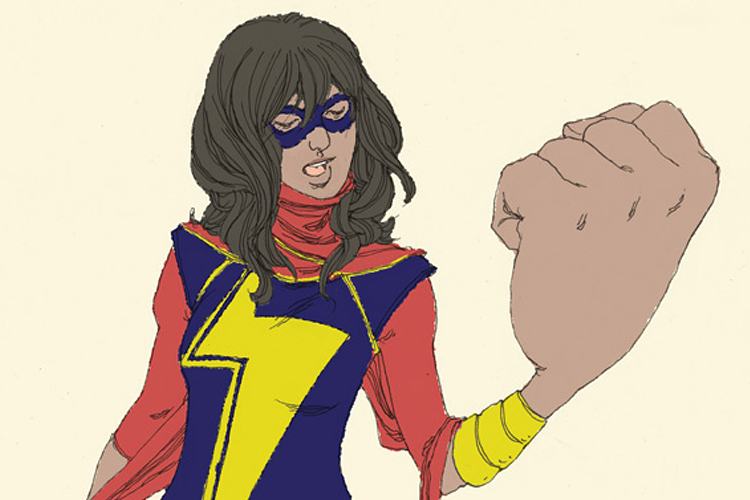 In Kamala Khan, Wilson and Amanat have created a superhero whose patriotism and contributions to Jersey City emerge because of her Muslim heritage, not despite it. She challenges the assumptions many Americans have about Muslims and is a radical departure from how the media tend to depict Muslim-Americans. She shows how Muslim-Americans and immigrants are not forces that threaten communities — as some would argue — but are people who can strengthen and preserve them. Kamala’s brown skin and costume — self-fashioned from an old burkini — point to Marvel Comics’ desire to diversify its roster of superheroes (as well as writers and artists). As creator Sana Amanat explained on “Late Night With Seth Meyers” last month, representation is a powerful thing, especially in comics. It matters when readers who feel marginalized can see people like themselves performing heroic acts. Bayoumi’s book echoes other studies that detail the heightened suspicion and racial profiling Muslim-Americans have faced since 9/11, whether it’s in the workplace or during interactions with the police. Each time there’s been a high-profile terrorist attack, these experiences, coupled with hate crimes and speech, intensify. Political rhetoric — like Donald Trump’s proposal to have a Muslim registry or his lie that thousands of Muslims cheered from Jersey City rooftops after the Twin Towers fell — only fans the flames. For example, in one of Ms. Marvel’s most powerful narrative arcs, a planet attacks New York, leading to destruction eerily reminiscent of 9/11. Kamala works to protect Jersey City while realizing that her world has changed — and will change — irrevocably. Carol Danvers appears to fill Kamala in on the gravity of the situation, telling her, “The fate of the world is out of your hands. It always was. But your fate — what you decide to do right now — is still up to you . . . Today is the day you stand up.” Kamala connects the talk with Sheikh Abdullah’s lectures about the value of one’s deeds, once again linking her superhero and religious training to rise to the occasion. In both cases, the lectures teach Kamala to take a stand to protect her community. Katie M. Logan is an assistant professor of focused inquiry at Virginia Commonwealth University.